Pewaukee Lake is a beautiful lake located in the Milwaukee metropolitan area. The overall size of the lake is 2437 acres with a maximum depth of 45 feet. There is an abundance of lakeside amenities around the lake making it a very attractive body of water for both recreational activities and fishing! 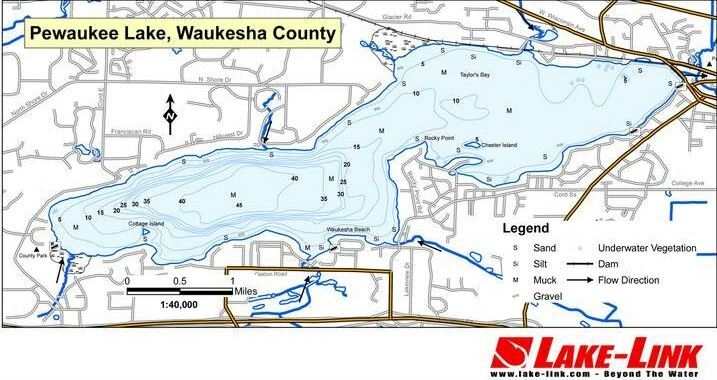 Above is a Pewaukee Lake map illustrating all the lakeside amenities with associated contact information below. A variety of fish species are present in Pewaukee Lake including Bluegill, Crappie¸ Bass, Muskellunge (Muskie), Tiger Muskellunge (Tiger Muskie), Northern Pike, and Walleye. Street parking is available along Woodland Drive and Lakeview Blvd. Swing by our docks and we will help you unload your gear before you park your vehicle.